Although it may not feel (or look) like it in Texas, autumn officially arrived a couple weeks back. 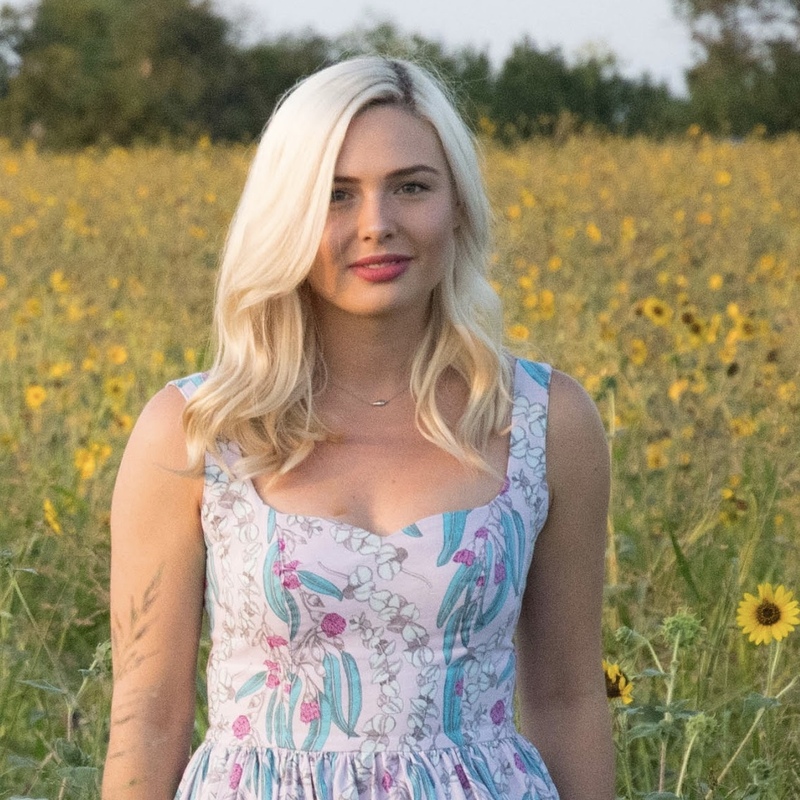 Although I will be sad to pack away my brightly colored sundresses, the warm and cozy colors that come along with the -ber months are truly some of my favorites. Warm camel colored leather, chunky sweaters, and leggings help make the decreasing temperatures a little more bearable. trying to capture some autumn vibes in warm, sunny Texas. As a nice warm welcome to the season, I’ve teamed up with a few talented fellow sewists (seen here, here, and here!) to head up #MeMadeFall2017. Our goal is to feature one particular handmade garment over each autumn month, to help ease our wardrobes (and hopefully, yours!) into the chillier weather. We’ve chosen 3 great themes that are broad enough to suit anyone’s style, yet cohesive enough to collaborate with each other in our creations. 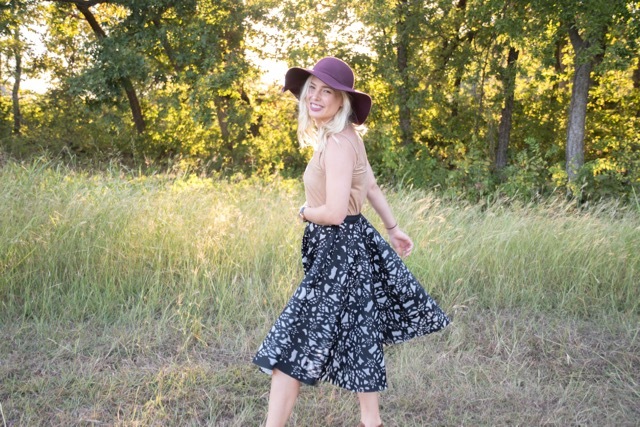 Charlie over at The Semi Minimalist is the mastermind behind this collab, and she kicked us off with her take on the fall midi skirt – a DIY button down, made with the perfect floral cotton. 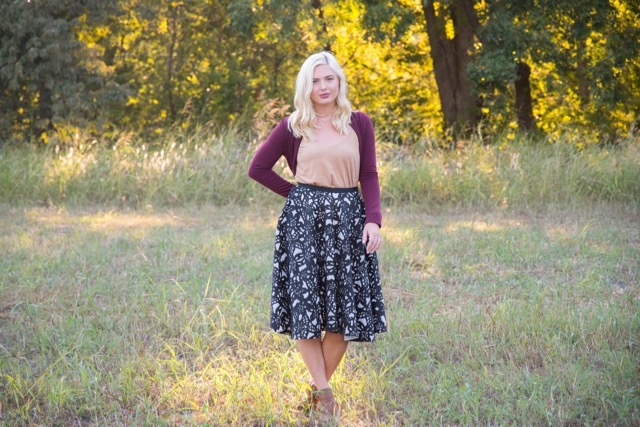 To check out her make, and get the info on how to make one yourself, see her post here: How to DIY the perfect fall midi skirt. 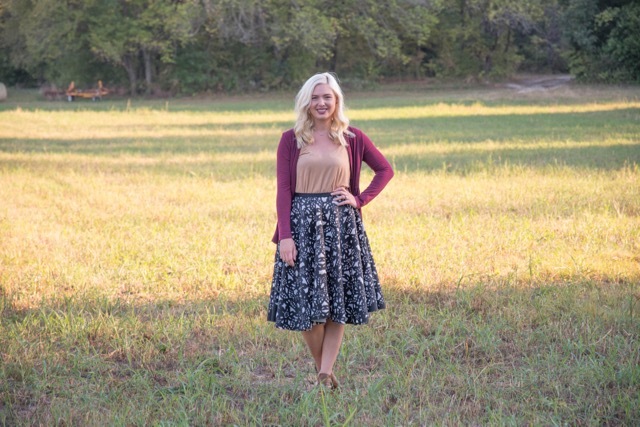 While I am looking forward to whipping up a button down midi à la Charlie, I’m excited to share with you all today my own take on the autumn midi skirt!! 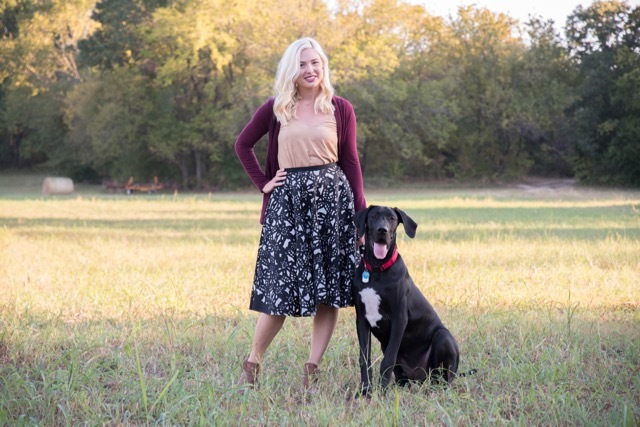 this cardigan was a little warm – Texas still doesn’t know it is autumn!! This fabric begged me to take it home so many times, and I kept resisting. I loved it, but I just didn’t know what I would make it into… Until Charlie contacted me about participating in the #MeMadeFall2017 collab. When she said midi skirt for autumn, I planned a trip back to JoAnn and picked up this unique scuba knit. For my skirt, I wanted big volume to go along with the perfect length. I decided my best bet to achieve this would be a circle skirt. check out this awesome fabric. Want to know something crazy? 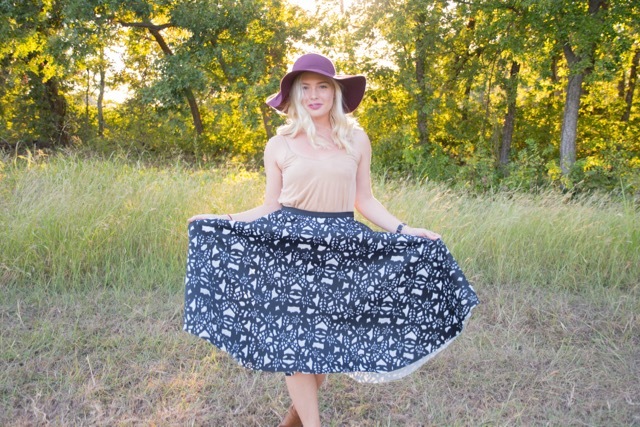 I’d never sewn a circle skirt before! So I went to straight to one of my most trusted sewing resources – the By Hand London blog! I followed their simple plug-in-the-numbers app , and immediately had what I needed. 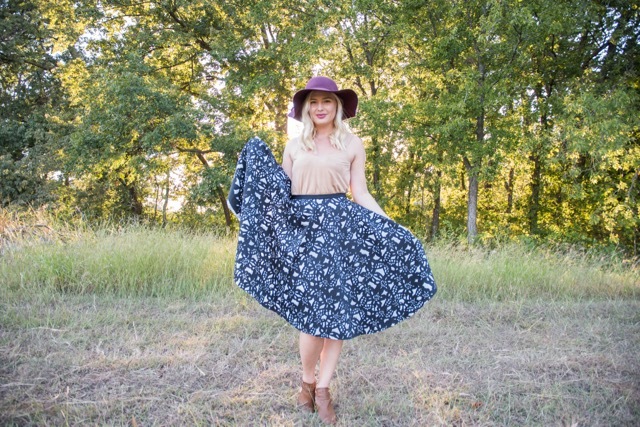 If you’ve got plans for a big, voluptuous skirt, check them out for the easiest instructions – Circle Skirt App!! 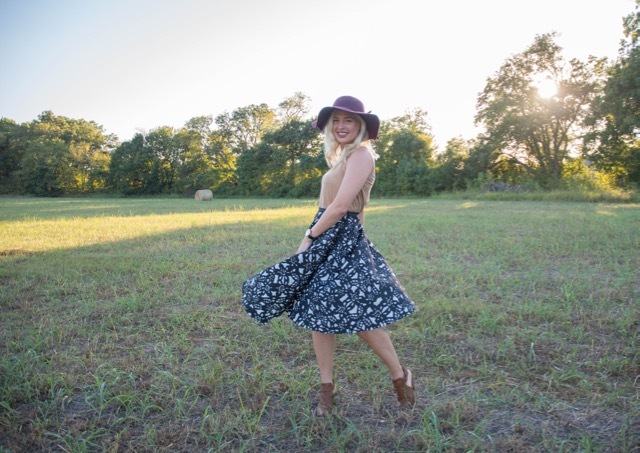 circle skirts – perfect for spinning! The construction of this skirt was simple, but the end result packs a pretty good punch. I’ve got plans to team this up with the army of Ogden Camis I’ve made recently (one of which is included here! ), to incorporate all the best of autumn colors. I’m also excited about the potential under-skirt-layering options this fabric presents. As you may have noticed, the black floral design is layered over an off-white mesh, which doesn’t actually lend to full opacity of the skirt. This means I can throw different colored slips (or other skirts or dresses) on underneath it and slightly alter the look of the skirt. I’m so excited about the versatility of this piece, and I have plans from dinner dates to holiday parties with this big old thing. ready for autumn to set in. accidentally ended up with an Ogden the same color as me… whoops. just pretty much in love with this.